Every once in a while comes along a Bollywood movie which entails the story of bravery and shows to the disbelieving audience the amount of courage it takes to stand headstrong in the face of an adversity. 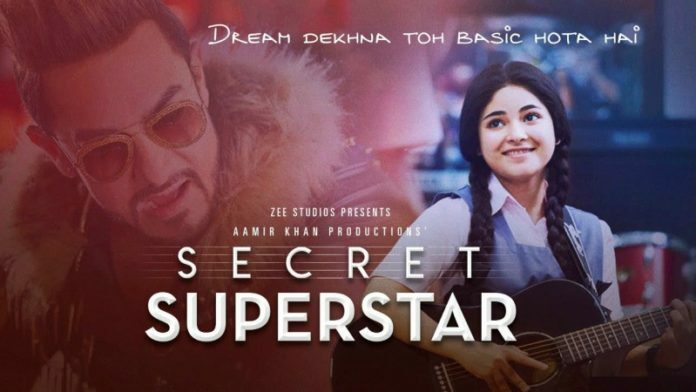 Secret superstar is a striking representation of not succumbing to circumstances but challenging them, fighting the odds with all you’ve got, and eventually escaping the clutches of conformity. The protagonist of the story is a 15-year-old Insu, played by actress Zaira Wasim, who you might remember from the movie Dangal where she played a young Geeta Phogat. In Insu, you would see a clichéd teenage girl, whose actions are governed by a life of unfulfilled fantasies and far-fetched ambitions. With a slightly skewed sense of judgment and the occasional case of emotional instability, Insu would take a leap into what she thinks suits everyone best, without taking into consideration the aspects of a pragmatic life. Yet, it is hard not to love the childlike innocence with which she does everything in good faith. The role of Aamir Khan, who plays Shakti Kumar, a washed-up music producer whose flamboyant and obnoxious demeanor makes him a rather tacky and unpleasant character to watch at first, is a crucial one for the success of the film. Khan’s comical character brings back his carefree yet well-meaning personas from Tare Zameen Par and 3 Idiots. However, as the story unfolds, one experiences a shift in judgment as his benevolent intentions become clearer to the audience. The underlying concept of the movie was a rather refreshing one, as it explores the themes of domestic violence, the insurmountable weight of destructive relationships and while the angles and several sequences of the film were slightly exaggerated and the dominant characters of Wasim and Khan, however, overshadow other roles such as that of Chintan, who plays Insu’s romantic interest, which could’ve shown potential had they been more developed and been given the chance to display their traits. Yet it is easy to overlook those imperfections as the movie itself engages the audience merely by its simplicity, and just the idea of how only the fortunate ones have the liberty to dream high is appealing to the average Indian. Although the ending is far from a fairy tale one as it urges the viewer to question the fate of Insu, her mother, and her brother, it stays on the surface with its realistic touch. Lastly, on the whole, Secret Superstar is a binding Bollywood movie for mothers and daughters with just a dash of the drama element combined with the overwhelming evolution of several prominent characters. Internet- Irony At Its Best?